Registration and class fees must be paid in full one (1) week prior to the class start date. Classes with less than 3 students will be cancelled. Please arrive 10-15 minutes early to set up and be ready to start class on time. You must have a legal copy of the pattern for class, as applicable. classes for that day will be cancelled. ** NEW ** Please print out and read all instructions prior to class. Supply lists are included in the instruction PDF file. I highly suggest you gather all supplies, precut batting/fabric and press fabric 2-3 days before the class date. Labeling all pieces helps keep everything organized. When all students are prepared and ready for class, we have more fun. 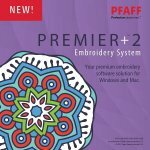 The Premier+ 2 software club is designed to teach you creative ways to make wonderful designs using the various features within the software. There are so many endless possibilities right at your fingertips.